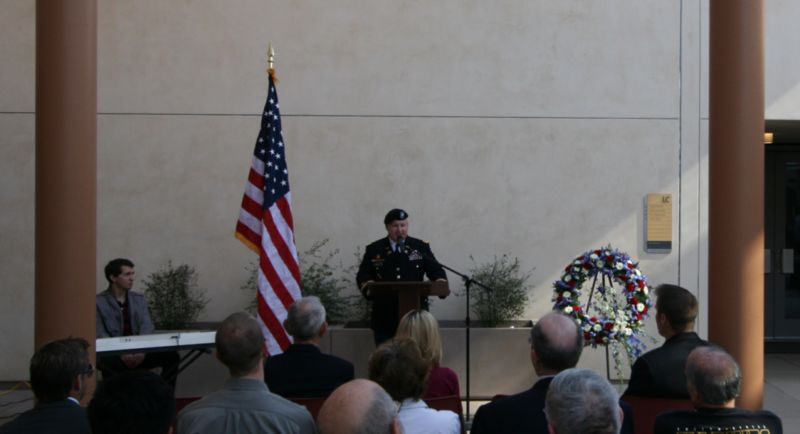 A Veterans Day Celebration was held at CMC on Nov. 11, honoring CMC's veterans, active duty personnel and current ROTC cadets. The event, held on the Veterans Patio at Roberts South, featured remarks by CMC President Emeritus Jack Stark '57 GP '11 and ROTC Professor of Military Science LTC Evan Wollen, along with piano music by Tim Rotolo '14. Stark remarked on the importance of veterans in CMC's founding in 1946: "The 80+ students that first came to CMC were almost all veterans. They came on the GI Bill [of Rights] and that's what founded this place," he said, detailing some of the famous World War II campaigns those veterans had been a part of and their eagerness to move forward with their education and move on to leadership in civilian life. "That spirit of the GI is still very much what characterizes the atmosphere at CMC," he said. Professor LTC Wollen remarked on the high performing ROTC cadets at CMC, adding a note on alumni currently serving: "Today in Afghanistan, a CMC graduate will fly a helicopter guided by an intel estimate written by one of his CMC classmates." The event was hosted by veteran and CMC Director of Leadership Giving Josh Walter '01, and presented by the Claremont McKenna Activities Committee in conjunction with the Claremont McKenna Alumni Association Veterans Affairs Committee.